Find out today with our Interactive Z-Degree Graphic! We already know that Oregon’s community college faculty are making progress on textbook affordability. 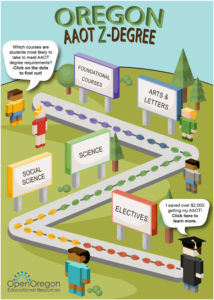 The new Interactive Z-Degree Graphic demonstrates that if we look at the big picture statewide, a transfer degree with zero textbook costs may be closer than we think. This page is not comprehensive – if you know of adoptions that are not on the list, please use this short form to submit your own course materials. How can there be a degree with ZERO textbook costs? OER are course materials that are freely available online and openly licensed so that faculty can do the 5 R’s: revise, remix, reuse, redistribute, and retain. You can download the material, tailor it to your course, save a copy locally, and share it back out with attribution. Students can access OER for free online or pay for low-cost print versions. Last summer, Open Oregon Educational Resources gathered locally relevant textbook cost data. The typical Oregon community college transfer degree student is likely to incur materials costs of $2,142.84 for a two-year Associate of Arts Oregon Transfer (AAOT) degree. Having to spend 20% again over tuition costs for textbooks can have a negative impact on student success and attainment. OER adoption helps students through textbook cost savings; to see all known adoptions at Oregon community colleges, visit the Open Oregon Resources page. The Interactive Z-Degree Graphic was made possible with graphic design by Sage Freeman, Media Production Specialist, Chemeketa Community College; and web programming by Tamara Marnell, ILS & Discovery Librarian, Central Oregon Community College. Many thanks to Sage and Tamara for sharing their expertise!